Founded in 1499 by Cardinal Cisneros, the University of Alcalá responds to a university city model that was unique at the time, developing around it an urban concept admired throughout Europe. The building that we can contemplate today is the Colegio Mayor de San Ildefonso, the current Rectorate, and its façade was built in 1543 by Rodrigo Gil de Hontañón and one of the best plateresque exponents. 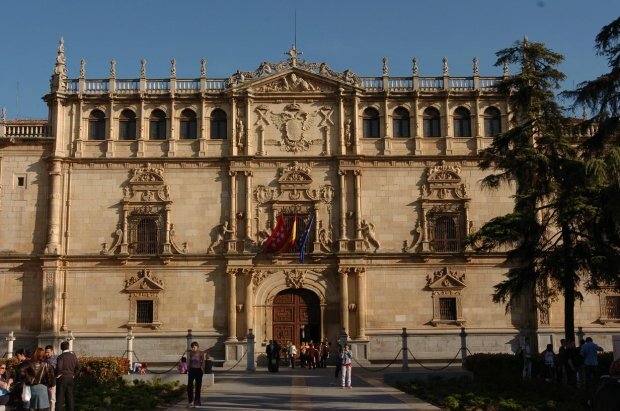 The University of Alcalá is heir to part of the General Studies created under license of Sancho IV of Castile in 1293 and completed in 1459 with the bull of Pope Pius II requested by Archbishop Carrillo by which three Chairs of Arts were created and Grammar that would be later integrated by Cisneros. Cisneros adapted the university to the era by opening it to society and allowing it to be a participant in knowledge. His intention was to specialize his teachings in Theology, adapting it to the principles of classical culture and also to train future political and religious leaders. Around the Greater School of San Ildefonso other smaller schools were created, some independent created by the own Cisneros and others that comprised of religious orders so much feminine as masculine. At the death of the Cardinal, foundations of private order were carried out by orders of cavalry and also by the diocese itself.